This is music to the ears of instrumentalists and fans of 3D printing alike. This is music to the ears of instrumentalists and fans of 3D printing alike. Professor Olaf Diegel, who teaches Product Development at Lund University, in Sweden, along with a band of students has taken two guitars, a drum set and a keyboard from a concept to the concert hall. The electric guitar was the first instrument to be completed and worked perfectly after just 11 hours of printing. “Then I tried making a bass guitar, which is more difficult as the strings cause much more tension and take more time, but that worked fine too,” he says. To complete the band, the New Zealand-born designer also produced a drum kit and a keyboard after a partnership with 3D Systems, the world’s leading manufacturer of 3D printing machines. It sounds like Diegel hit the right note from the outset but actually he worked on the musical instruments for nearly three years before reaching his crescendo. “During this time, I made over 55 guitars and basses, three drum kits, two keyboards and most of them were sold within the last two years”, he says. After printing, the instruments’ bodywork is painted. The manmade aesthetics are an area, which can draw suspicion and questioning over the quality of their sound. But according to the creator, they are comparable to any high-quality instrument. “So far, all professional musicians that have played them have been quite impressed and not just by how they look but also by how they play and sound. The quality of the instruments speak for themselves,” he says. Diegel is now working on a second version of a 3D-printed saxophone and is considering making a one-of-a-kind wind instrument, like a flute on which it is possible to play complete chords, together with the melody. “3D printing allows us to make products that would be impossible to make using conventional technologies. If I were making conventionally-shaped guitars then there would be better, more cost-effective ways of making them. But because the shapes of my guitars are incredibly complex, it’s the ideal technology to use,” he concludes. Friends, customers, printaholics – lend us your ears and join us along a 3D printed musical adventure! A recent post which featured one of Malta 3D Printing’s favourite little musical toys – a kazoo – inspired us to continue down this musical vein. To place things into perspective, the 3D printable instruments of today are split into three categories. Firstly, we have ‘experimental pieces’, which don’t have a conventional equal outside of the realm of 3D printing. Secondly, there are ‘enhanced instruments’, which improve the qualities of an already existing instrument thanks to 3D printing’s unique capabilities. Finally, we have replications of existing instruments, which have no real added benefits compared to the traditional piece. Pictured above is a prime example of a 3D printable musical piece still in experimental stages. This unusual trumpet is reminiscent of a modern painter’s masterpiece rather than a practical musical device. While this aesthetically pleasing instrument is yet to be created, there are others which are already in circulation. In a different interview, flute player Seth Hunter emphasized the plastic flute’s acoustic similarities to the traditional metal ones. He also noted the slight misplacement of the keys – but remember – 3D printing encourages technicians to fix any minor errors in the subsequent print. Created by yet another student from MIT, Amit Zoran was not far away from creating an exact replica, and this was way back in 2011. The traditional flute falls under the ‘existing instrument’ category, but our next pick certainly has its fair share of enhancements. A laser-cut violin made from plywood, this stringed instrument was created by Ranjit Bhatnagar, a sound art enthusiast. Its’ bulky wooden outer shell provides a stern contrast to the graceful sounds it can produce. Bhatnagar even took his masterpiece to the streets, inviting different violin players to fiddle away. ‘Ranjit’ as he is known on Thingiverse, has a personal page chocked full of free designs for different instruments – including an okarina, organ pipe, spiral panpipes and more. Next up is another piece seeking to replicate an original design, but this one is slightly different. At four feet long, this home-made behemoth requires many printing sessions. Clearly, this great bass recorder functions well – and the creator has since improved on his original work. The recorer is made up over 48 inches of PVC pipe measuring 1.5″, a few sections made of 2″ and multiple, custom built 3D pieces. Created by Instructables user ‘sngai’, a quick internet search will reveal that opting to print this object as opposed to purchasing a store-bought one will save players a lot of money. Who knows what the future holds? PLA pianos, ABS acoustic guitars and printable drum kits may soon become popular. 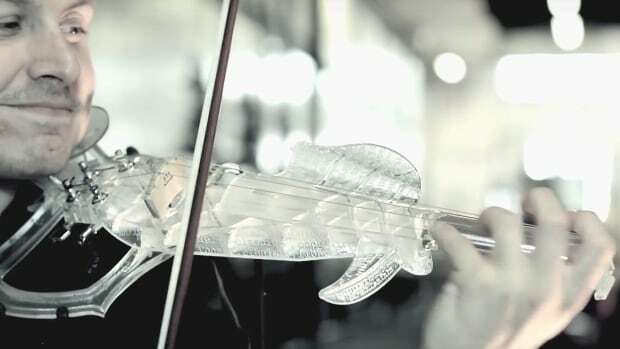 As the number of 3D printed instruments continues to grow, its only a matter of time before musicians hop on the fast-moving bandwagon! The creator of a 3D-printed band tackles the making of an alto saxophone and delivers a surprisingly soulful instrument. Olaf Diegel enjoys making music with unusual instruments. He’s the designer behind a series of guitars, a set of drums, and a keyboard shell that all came out of a 3D printer. He wasn’t content to rest there, though. Now he has a 3D-printed alto saxophone, an instrument that shows both the current capabilities and future promise of 3D printing. The sax, printed from nylon, consists of 41 components, not counting screws and springs. It’s incredibly light, weighing in at just over one pound. 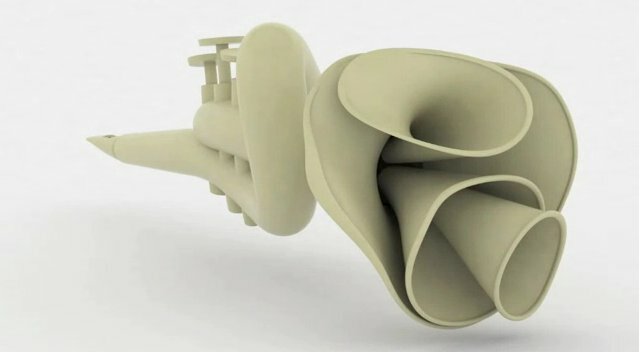 While the technical challenges of 3D-printing a saxophone were considerable, the result is an instrument that sounds quite lively. “Surprisingly to me, the sax sounds very much like a sax,” Diegel writes. Diegel used a traditional sax for the template. The whole project took about six months, with the actual assembling time taking several weeks to get the sax functioning properly. This particular sax is a prototype. Diegel is still perfecting the mechanical function and fixing an air leakage issue that causes a couple of the notes to be out of tune. With his other instruments, such as the 3D-printed guitars, he took a lot of creative liberty with the design. He plans to do the same for future versions of the saxophone, taking advantage of the flexibility 3D offers. His guitars have come in the form of see-through beehives, spider webs, and even a steampunk design with internal gears on display. Diegel’s experiments with 3D-printed instruments have a larger purpose. “One of the reasons I was keen to undertake the project was to show that 3D printing can be used for applications beyond trinkets, phone cases, and jewelry,” he writes. He enjoys combining 3D-printed parts with traditionally manufactured pieces to create hybrid designs. It’s not 3D printing just for the sake of 3D printing; it’s about finding the right place for 3D printing in the manufacturing chain. The side effect of this quest is a series of beautifully printed instruments which can now lay claim to a “brass” section. 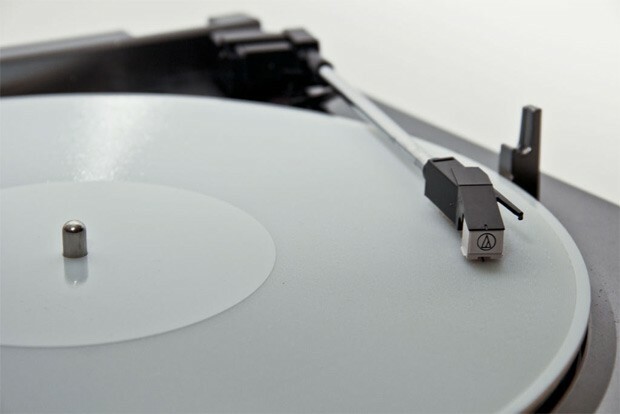 3D printable records that work on standard turntables!! If you thought downloading music from the internet had nothing new to offer, think again. One of the tech editors over at Instructables — Amanda Ghassaei — has put a new twist on the digital delivery of music by 3D printing a record. Ghassaei developed a technique that converts digital audio files into 3D printable (33 rpm) grooved plastic discs, that actually play on regular turntables. Not only that, she printed some functioning prototypes as proof of concept. The printer used was relatively high-resolution, with 600 dpi on the x/y axes, and layers just 16 microns thick, but the audio quality is still somewhat low — 11KHz, with a 5 – 6bit resolution. The important thing, however, is that it worked — highlighting even more uses for the burgeoning technology. Want to know what it sounds like? Skip the needle past the break for a lo-fi (or is it “warmer”) demo that includes Nirvana, New Order, Daft Punk and more. Want to make your own? Head to the source for the blow-by-blow instructions.